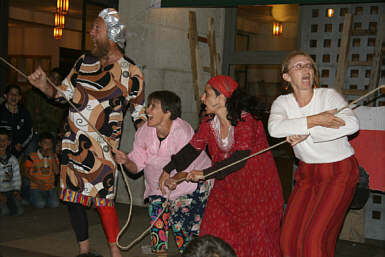 The Catalystica Players are a unique collaborative of creative folk which engages its social settings through the practice of theater, puppetry and clowning. Catalystica seeks to challenge and inspire its audiences to ask questions about their circumstances and pursue their own solutions to critical social issues. Espousing nonviolence as a lifestyle, creativity as a state of mind, and peacebuilding as the means to a better world, Catalystica tries to mend rips in the social fabric and bridge chasms in the social realm by being a catalyst to other people�s thoughts and actions. 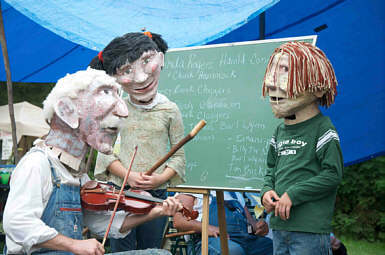 With original music and through mixing media of giant puppetry, carpe locus theater, traditional theater, shadow theater, hand puppets and clowning, Catalystica participates in a storytelling process designed to fire the imagination of audiences. 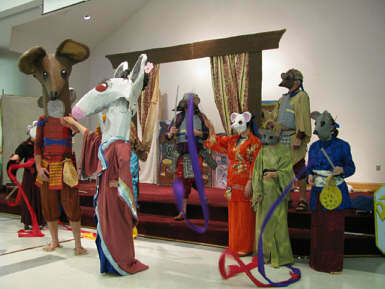 Not only does Catalystica perform, it also asks audiences to participate in the active creation of the show. During workshops, the group will take a particular issue, and ask participants to articulate their realities; then they create characters and work with the selected issue through theatrical interaction to explore ways of arriving at solutions. Audience members are asked to take roles to help resolve the action described. Catalystica not only entertains, but also provides a creative means to speak to and about our environments leading to a more peaceful, just and livable world. Besides performing throughout their home-base area in East Tennessee, Catalystica members have performed across the Southeast and Midwest various capacities. 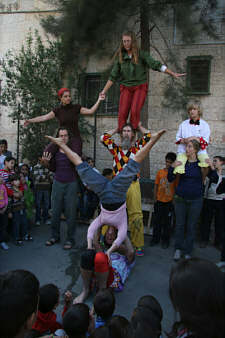 As part of the Olive Tree Circus, Catalystica traveled to Palestine�s West Bank teaching and performing in the Occupied Territories. 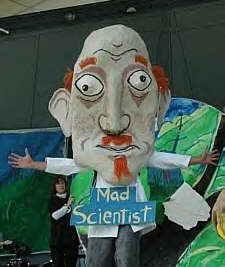 As a musician, writer, performer, artist, builder and clown, Kevin brings a wide range of skills to the theatrical stage. He has performed throughout the Southeast and Midwest and adds a distinctive mix of practical skills and artistic imagination. Having been trained by Ringling Brothers clowns, both Kevin and Cindy have clowned around for almost twenty years. 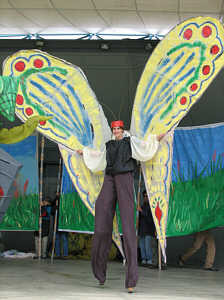 Cindy also contributes amazing skills in fabric arts, performance and education. Kayce and Will act and clown with their parents and on their own while learning and teaching theater skills and clowning. 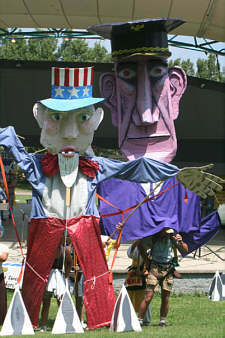 Circus Catalystica also collaborates with several other performers across the nation as need and availability dictates.